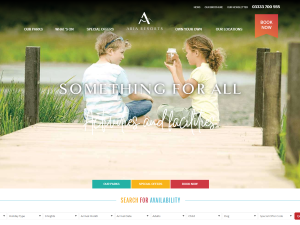 Aria Resorts are the proud owners of several beautiful resorts across Cornwall, Yorkshire and the Isle of Wight. Experience lakeside luxury at Rookley Park, sink into the hot tub at The Bay Colwell, relax in luxurious lodges at Retallack Resort, curl up next to the flickering fireplace at The Bay Filey, or enjoy touring and camping at Newperran. Rookley Park – Centrally located with lakehouses, cottages and caravans set in beautiful parkland. Rookley also has a range of family activities. The Bay Colwell – A stone’s throw away from a sandy beach, the luxury hot tub cottages at Colwell are set in a tranquil clifftop location by the sea. Retallack Resort – Situated in the heart of Cornwall, Retallack has a beautiful collection of luxury lodges and suites, with an award-winning waterpark and spa, offering a wide variety of aquatic activities. Newperran – Caravans and touring pitches with sea views of the wonderful Cornish coast. Facilities include an indoor pool, adventure playground and skate park. The Bay Filey – Set in wild meadows, next to a beautiful sandy beach, and with its own leisure complex, Filey is the perfect location for active family holidays.